It looks like people want to get healthier … maybe we should all do more field work! I’m happy to see how many are planning to submit papers — but I was hoping to see more planning to chair technical sessions at meetings. If you want to see what you study have a higher profile at meetings, you need to be the one to make it happen. 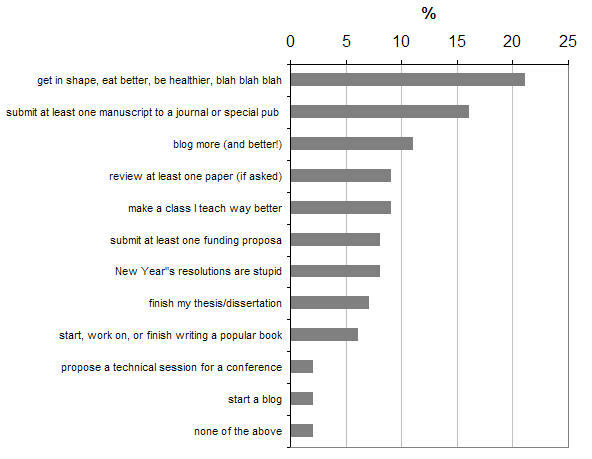 I’m also a bit surprised at how few are planning to start a blog — have we reached saturation point? And good luck to those planning on finishing their graduate studies! In addition to making plans or resolutions, the end of the calendar year is also a nice time to make some predictions for the upcoming year. Most of the predictions you read about or see on TV will be about the economy, technology, fashion, and the like. 1) I’m going to out on a limb and predict that there will be weather every single day! 2) Someone will come to a brilliant conclusion, with amazing implications, that no one foresaw. Sadly, that person will be wrong. 3) A religious spokesperson will lay out a piece of evidence for creationism/intelligent design/young earth that will create the disturbing sense of simultaneous nausea and hysterical laughter in members of the earth science community. 4) Someone will be born. Someone will die. And life will go on.